This post is the first in a new series about how to learn to write Chinese characters. I’m not concentrating on simplified or traditional characters here, I’m just talking about the basic principles. Let’s start right from the beginning. Each Chinese character is made up of different strokes. A stroke means a stroke of the pen. In other words, every time you lift up your pen and start to write again, you are starting a new stroke. Because you are writing strokes, you are writing according to a fixed method with individual strokes in a specific order. For this reason, writing Chinese is nothing like drawing, it is very much ‘writing’. Before starting to write full Chinese characters, it is useful to look at what kind of strokes are used to write them. One book I read identified 12 different strokes. These make up every Chinese character. Let’s look at them now. After you understand each stroke, try writing it a few times to practice, according to the picture. This one is a horizontal stroke, write it from left to right. Next we have the vertical stroke. Write it from top to bottom. This is the left-falling stroke, writing from top to bottom, and curving to the left. Try to make yours look like the one in the picture. 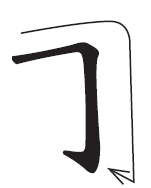 This one is called a ‘dot’ in Chinese, however it is actually a small movement of the pen, written from the top downward and towards the left or right. Pay attention to this one. This stroke is written from the bottom upwards, from bottom left to top right. It looks like the stroke above on the right, so it is important to make sure you are writing the right one, but don’t worry about that just yet. Ok, we have covered the basic strokes. The rest of the strokes are really just combinations of the above. These strokes have a little hook on the end, to write them, do a little flick of the pen at the end, but make sure you do it in the right direction, try it! Alright, so these two are basically like the corners of a box, composed by combining a horizontal and vertical stroke. Give them a try. This one is essentially the same. Write a horizontal stroke, then a vertical stroke with a hook on the end . This one is a horizontal stroke then a left falling stroke. So there you have it. These are the basic types of stroke that make up every Chinese character. Practice them until they look like the pictures on the side, and then i’ll see you for Part 2 !